Amma is full of surprises. She bestows upon Her children many beautiful situations that ever remain fresh and bright in their hearts. These precious moments, however, are not planned; they are spontaneous. As Amma beholds the entire creation as a wonder, whatever She does automatically becomes a wonder itself. It is indeed true in our relationship with our most beloved Amma. As She spends hours on end with us—laughing, playing, singing, meditating, sharing Her infinite wisdom and even joking—we forget the greatest of all truths, that within this short form of Amma’s resides the infinite shakti of pure consciousness, which is none other than our very own Self. 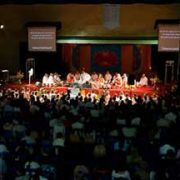 Nonetheless, the last day of this year’s Australian tour served as a powerful reminder of Amma’s infinitude nature. That evening, Amma suddenly came out of Her room and went to the seashore. 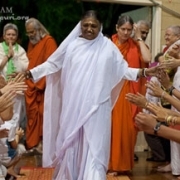 Although Amma’s decision was quite unexpected, devotees appeared out of the blue, and the group grew bigger as Amma walked to the beautiful beach. Wherever Amma is, irrespective of time and place, Her children immediately flock around. It’s as if they’ve developed a sixth sense that enables them to know the exact moment when She comes out of Her room. When Amma reached the shore, She stopped and stood still at a spot where the waves came rushing forward to touch Her sacred feet. It was as if the ocean’s waves were also Her children, competing with one another to be as close to Her as possible. In the presence of the setting sun, Amma stood like another ocean—the ocean of pure boundless love. After a little while, Amma started moving into the sea. Only when the water reached past Her knees did She stop. As Amma stood there, it seemed as if She was staring at infinity, the point where the ocean touches the sky—but I really don’t know. How can I judge? Can infinity look at another infinity? No matter what the situation, in Amma’s presence Her devotees often become oblivious of their circumstances and forget everything. Of course, why fear when Bhavatarini [the Mother who takes everyone across the ocean of birth and death] Herself is with you? Maybe that is what the devotees were thinking as they—even those who didn’t know how to swim—fearlessly braved the ocean waves. Thoroughly enjoying the moment, Amma laughed blissfully and squealed with delight as each wave came roaring towards Her. The devotees joined hands, forming a circle with Amma in the center. Allowing all the bees to drink Her sweet nectar, Amma remained like a pure white lotus in their midst. A few minutes later—like a playful child—Amma was found sitting on the beach, making little temples with the wet sand. Amma made one, two, three, four, five temples, but willingly let the waves wash each one of them into the sea. The devotees sat around Her, watching in silence. At this point, Amma proceeded to tell a story. It was about a man who’d just found out that his business had gone bankrupt. Devastated, he walked to the nearby beach with the determination that he would drown himself in the powerful waves. As he walked towards the shore, he came across a small group of children who were busy making temples out of the sand. These were not simple piles of mud made with haste, but elaborate creations with many levels and towers, each of which took the children nearly an hour to make. Yet despite all the effort the children put into constructing the temples, they seemed to take the most delight in watching the ocean come forward and wash them away. The businessman sat on the shore, watching them continue like this for several hours, and, as he did so, something within him shifted. His tragedy seemed less, and he eventually got up and returned home with the regained confidence and enthusiasm needed to carry on and rebuild his business. When the song ended, Amma fell silent, reveling in Her own world. With Her eyes closed, Amma still stood facing the vast ocean. The only sound was the sacred syllable ‘Aum’ as it reverberated with each rising and falling wave. The moment was beyond words, so too the inner experience. There, on that shore with two oceans, Amma gave us a glimpse of the ineffable.